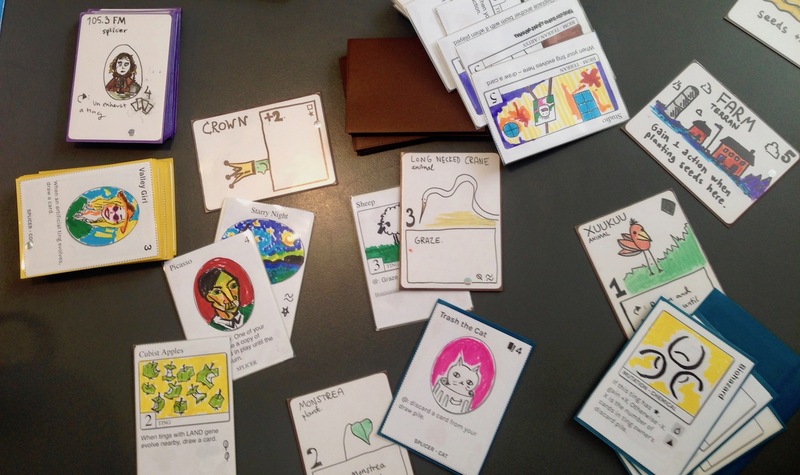 This is splicers, a game where anyone can make their own cards and play against each other. The website makes it super easy to manage your designs and print them out. What are you waiting for? Sign up now and start creating! Collectible card games (like Magic the Gathering or Pokémon) are truly awesome but they also have some problems. First of all they cost a lot of money to play since the cards have to be bought in small booster packs or from people who have made it their business to trade these cards. Secondly these games are made by a small group of people who curates the pool of cards. This is obviously great for the quality of the game - they work with this all day long after all - but it also means that a lot of creativity is wasted. YOUR creativity that is. This is why we made Splicers! It is a collectible card game where everyone is allowed to contribute their ideas for cards. Anything goes, although there are also guidelines to keep the game somewhat cohesive and understandable. If you don't want to come up with cards, that's cool too - you can just create decks with the existing cards and play against others! You should definitely check out the cards that people have made. Hopefully that makes you wanna read the rules so you can play the game! You can also check out our GitHub repository with all the code for this website, or join the Discord channel where we discuss the development of the game. The Splicers project (including the rules and this website) was started in the summer of 2015 by Ossian Borén and Erik Svedäng, two game designers from Gothenburg, Sweden.